People hugged, or traded reactions in hushed, awestruck tones. More than one person's voice choked trying to describe what they'd just seen. Most preferred not to talk at all. A man gets his camera ready to photograph the Great American Eclipse at an eclipse viewing party. 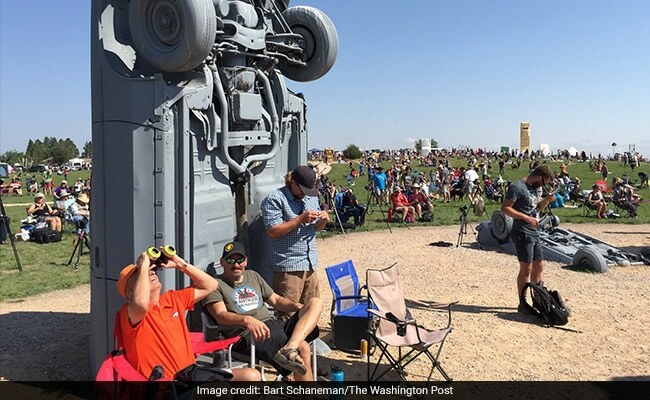 Millions of Americans gasped and groaned Monday as the first coast-to-coast total solar eclipse in 99 years zoomed across the country, dazzling many but disappointing some whose view was obscured by clouds. For about 90 minutes the shadow of the moon raced over mountains, plains and forests at twice the speed of sound, from the coast of Oregon to the Atlantic wetlands of South Carolina. For the lucky viewers, it was glorious. "Awesome!" people said over and over. "That was nuts," said Sage Reuter, 20, in Culver, Oregon. "You weren't kidding about the goose bumps," a man in Casper, Wyoming, said. Onlookers cheered, rang bells, prayed, and wept as an eerie midday darkness fell. Some counted down the minutes to approaching totality. The crowd gathered at the site of Carhenge, in Alliance, Nebraska in the US. In Carbondale, Illinois, scheduled for 2 minutes 38 seconds of totality, clouds threatened to obscure the event at its peak. But they suddenly passed, and the fully eclipsed sun emerged. "Diamond ring!" one person shouted, describing the characteristic gleam of the sun's last rays shining over the moon's rugged terrain. "Wow," said Beth Dellow, of Baltimore. "I feel different. I can't describe how. But I do feel different." "What an experience," said Carol Bleinstin, "at one in the afternoon, to be in total darkness. Nature really is gorgeous, and has something to teach us all the time. You just have to look." 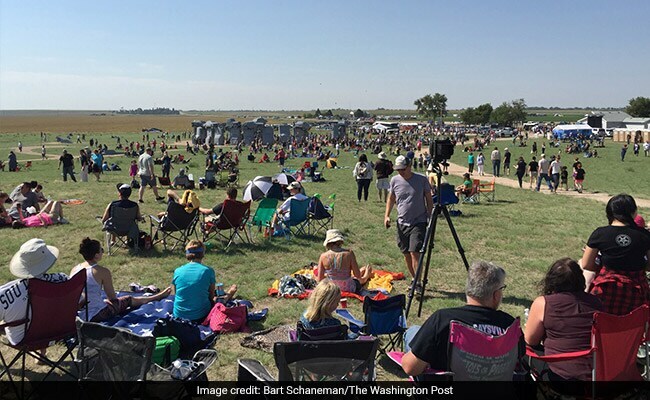 Crowding into the 70-mile-wide band of eclipse totality, people had thronged the shadow's 3,000-mile-long path, camped out in tents, parking lots, and football stadiums. They came by train, by car and on foot, jamming small towns worried about the influx of outsiders wearing eclipse T-shirts and cardboard eclipse glasses. One community, fearing for its dead, roped off a small cemetery, to keep eclipsers from parking there. Observers watched the glittering atmospherics, as the moon blocked out the sun, from beach chairs, from big-city rooftops, and from 11 different spacecraft, NASA said. The sun is "our star!" one NASA expert said. The anticipation was intense ahead of the coast-to-coast total solar eclipse in the US. Starting about 9 a.m. Pacific time, the country was mercifully distracted from the dire news of the world, until the last remnants of the eclipse slid off the beaches of South Carolina, near Charleston, a little after 4 p.m. Eastern time. And when it was over Monday, the weary moon, itself, went dark, entering the new "black moon" phase in its cycle. Monday morning, the anticipation was intense. "It's starting!" a woman on the Oregon Coast cried as the eclipse began. "It's starting!" On misty Fishing Rock, near the centerline of totality, in Pacific Palisades, Oregon, Perry Washington, called to his sons, "It's about a 16th" blocked! Then: "Oh shoot! The fog is in again." And a fog horn sounded in the distance. "You can feel it!" said Julie Gess-Newsome, the dean of academic affairs at Oregon State University-Cascades, as she watched in Culver, about 200 miles inland. "It's getting cooler. It's starting to feel like sunset." In Carbondale, Illinois, about 300 miles south of Chicago, Haja Goggans, 17, who had driven more than six hours from Milwaukee, tried to hold on to the wonder in the moments afterward. "When it was cloudy right before," she shook her head. "Everyone was so sad. And then this little sliver appeared. It was giddy." She recalled the cheer that went through the crowd - Goggans herself started whooping - and the intensity of knowing everyone around her was feeling the same thing. "The only thing we all cared about was the sun, the moon and the sky. We all were here for one reason." As the applause and cheers for totality died out and the sun returned, a reverent quiet fell upon the crowd. If before totality had been a carnival, the aftermath was like an especially moving church service. They put their glasses back on and gazed at the slim yellow crescent in the sky, still thinking about the brilliant, sparkling, effervescent version of the sun revealed by the moon. In Washington, outside the path of totality, the eclipse began a little after 1 p.m., and the sun was 81 percent covered at the height of the eclipse at about 2:40 p.m. In downtown Washington, onlookers crammed rooftops on a hot and steamy afternoon, with thunderstorms brewing to the west. "First contact starts now!" yelled Claire Hinrichs, a physics and astronomy student at the University of Maryland, as people gathered there with eclipse glasses to watch at around noon. "You may not be able to notice yet," she yelled again, as bystanders moaned. Then someone yelled, "it's happening!" But in Fairfax City, Virginia, at 2:36 p.m., minutes before peak eclipse, thick, dark clouds rolled over the sun like a curtain, and thunder rumbled in the distance. Charlie Maguire and his ex-girlfriend Jitchaya Mobundit, both 32, stood in a 7-Eleven parking lot as the final rays of the sun were blotted out. They had stopped at the convenience store to get a pair of eclipse glasses. "Yeah clouds," Maguire said. "I don't know if I can assess how disappointed I am." After staring at the clouds for a few minutes, they got back in their car and left. Minutes later, a torrential downpour began. But the moment was saved for some near Woodbridge, Virginia, when a bright pink, green and blue rainbow poured out from a cloud opening where the sun beamed through. "Oh, my God a rainbow!" Michelle Sege-Khalid, 48, shouted. Suddenly cellphones were pointed skyward, and Sege-Khalid's children - Daniel, 8, and Jewels, 10 - danced around in the rain. Within minutes, the sight was gone. "That was beautiful," Sege-Khalid said. 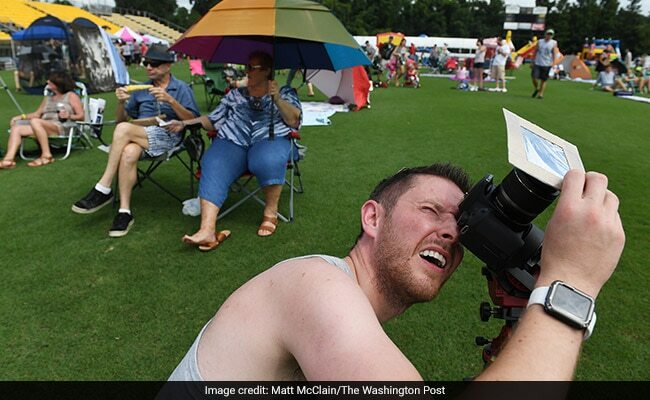 US solar eclipse: People put their glasses on and gazed at the slim yellow crescent in the sky. In South Carolina, at 2:37 p.m., for 2 minutes 37 seconds, the moon covered the sun at Clemson University and several thousand people, standing in the dark, shouted, hooted and hollered. The clouds that had been playing games with the sun early in the afternoon left, and Clemson got a perfect view of the total solar eclipse. Bugs, thinking it was night, began to buzz, and Jupiter and Venus shone in the sky. "It was the coolest thing I've ever experienced," said Helen Rose, 20, a junior at the University of Maine studying engineering, who came with a contingent as part of the NASA-funded Eclipse Ballooning Project. The group released a balloon with cameras to live stream the event. "You could see the sun rise and the sun set, with the shadows on the trees making a crescent. I could hear the bugs," she said. The crowd quieted as the sun's corona shone, and then, like a diamond, the sun began to shine, and the total eclipse was over and there were more hoots and hollers. Stewart Doe, 19, a junior from the University of Maine who traveled with Helen Rose, said "Oh my God, that was so great. If you didn't have glasses on, you wouldn't have noticed what was happening until it got dark." Rick Brown, a commodities trader in New York who is an eclipse chaser on the side, said this total eclipse was as fine as any of the other 15 he has seen in his life. "It was a great eclipse." Bill Rhyne, spokesman for the South Carolina Highway Patrol, said he was thrilled that there were few accidents reported in the area. His concern was that there would be more as thousands of people hit the road to return home. "They are all leaving like ants going back to their regular lives," he said. Along the coast, the clouds won out. Twelve minutes before totality, the sun peeked through a hole in the overcast, exposing just a fingernail of the partially eclipsed star. 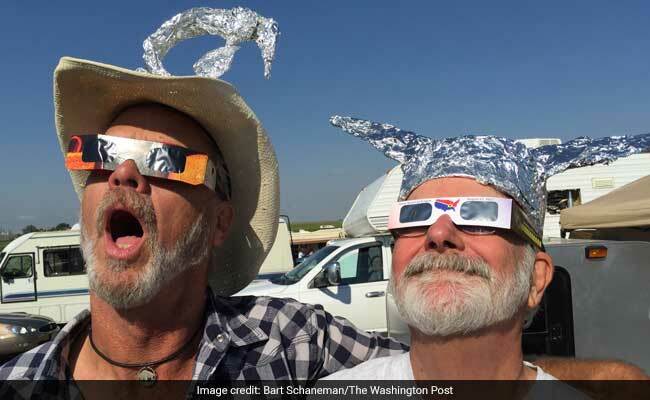 "C'mon, clouds, c'mon," Steve Garrett, 64, of Winchester, Virginia, said as he watched from Charleston. No such luck. At 2:46 p.m., the day went dark and, as a flock of crows flew overhead to roost, a thick blanket of clouds separated hopeful eyes from totality. Could watchers take their eclipse glasses off? Sure, came a reply. There was nothing to see, except for a distant flash of lightning. Andrew Nadler, who'd traveled to Charleston from New York, was disappointed. "The sky wasn't quite as dark as I'd thought," he said. But Garrett was satisfied. "Just being here with all these people in the darkness, that was really the most incredible thing," he said. In Belton, South Carolina, 200 miles inland, Josh Skierski and Vanessa Palacios of Atlanta had planned to get married during the eclipse. "We were trying to find the location that spoke to us," Palacios said. "We're not exactly traditional," Skierski said. "Anybody who knows us knows it was going to be weird and going to be fun." So they said their vows alongside five other couples at Blue Jar Barn in Belton, in the path of totality. Afterward, the Rev. Duane Jenkins, who officiated, warned everyone in attendance to don eclipse glasses and then Skierski and Palacios walked down the aisle as husband and wife, joining their dog, Leona. They put their arms around each other, looked up at the sky and bathed in 2 minutes 27 seconds of totality. People cheered and a car horn honked. "That's the start of our journey together, and it's historical, but it's also something that we got to experience together," Skierski said. "My whole body felt warm," Palacios said. Kaplan reported from Carbondale, Ill. Leah Sottile in Newport, Ore.; Joel Achenbach in Madras, Ore.; Sarah Gilman in Depoe Bay, Ore.; Carissa Wolf in Idaho City, Idaho; Julie Zauzmer in Idaho Falls, Idaho; Dustin Bleizeffer in Casper, Wyo. ; Julie Vick in Glendo, Wyo. ; Bart Schaneman in Alliance, Neb. ; Brandon McDermott in Beatrice, Neb. ; Sara Shipley Hiles in Columbia, Mo. ; Terena Bell in Cerulean, Ky; Brandon Gee in Nashville; Jared Flesher in Gatlinburg, Tenn.; Angela Fritz in Bryson City, N.C.; Valerie Strauss in Clemson, S.C.; Isabelle Khurshudyan in Belton, S.C.; Ben Guarino in Charleston, S.C.; and Arelis R. Hernández, Justin Jouvenal, and Antonio Olivo in Washington contributed to this report.